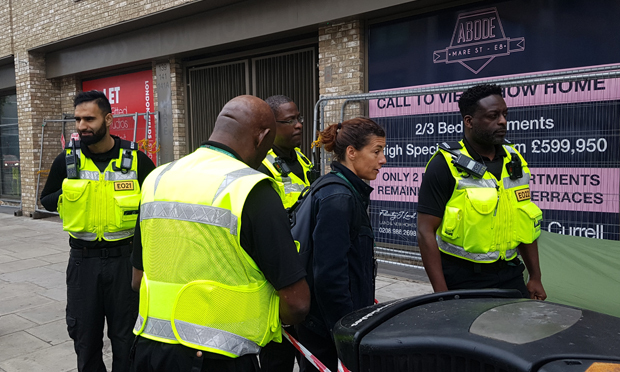 Hackney Council has defended its “enforcement action” to remove two homeless men living in tents on a Mare Street pavement. Raja Hamid and Bertram Johnson had been living outside the Abode apartment block for six months when they were served an enforcement notice which gave them two weeks to move. Hamid’s possessions, including his sleeping bag, pillow and tent, were loaded onto the back of a truck for destruction. A council spokesperson said: “As far the action is concerned, the desired outcomes have been achieved with the tent being removed so it no longer causes a dangerous obstruction to pedestrians and the number of complaints of anti-social behaviour have reduced. “The allegations we received suggested that the tent was not being used as a regular place to sleep, but for anti-social behaviour. “Before enforcement action was requested, the enforcement team had been trying to identify the people who were living there and refer them to the homelessness charity Thames Reach, as they are Tower Hamlets’ clients. Hamid had questioned the legality of the enforcement action, claiming a paperwork error had his name filled out incorrectly. Quizzed by the Citizen on whether the enforcement actions were incorrectly served, the council spokesperson said: “On 9 May a notice was served on the obstruction. A further notice was served for the obstruction in the name of the person who claimed responsibility for the obstruction. Citizen reporters observed Hamid immediately returning to the same spot once the council enforcement team had left, with Johnson relocating to a spot at the Texaco garage opposite. At the time, Hamid told the Citizen that if the enforcement team returned, he would then move round the corner so that the council would have to serve him a new notice. Six police officers were also at the scene during the enforcement action, having been called by a Police Community Support Officer (PCSO) to deal with allegations of racial abuse of the enforcement team leader by Johnson. On arrival, the police spoke to Johnson for around fifteen minutes, but took no further action. It is unclear what the cost to Hackney Council of the enforcement action was. Responding to the Citizen regarding the cost of the enforcement action to move the two men on, a council spokesperson said: “As this was not an operation but a request for enforcement action to be taken, this did not require an additional cost. The two men were moved on by an enforcement team of five, with the support of a PCSO.